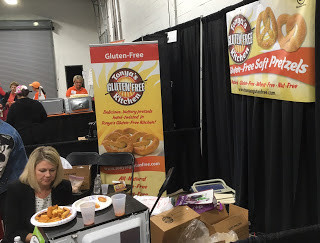 With the tremendous increase of gluten-free products and restaurant options in the Delaware Valley, the third annual Greater Philly Gluten Free Expo no doubt will be bigger and better than ever this year. The expo is scheduled for Saturday, May 19 at the Greater Philadelphia Expo Center in Oaks (100 Station Ave.). The event will once again include local and national exhibitors, educational presentations, door prizes and, of course, plenty of gluten-free samples and concessions. The expo will be open to the public from 10:30 a.m. to 4:00 p.m. in Hall C. VIP tickets are sold out, but general-admission tickets are still available. General-admission tickets are $10.00 each in advance ($15 at the door), with kids 12 and under free, and can be purchased by phone at 1-800-827-6397, at any Wegmans service desk or online. Free parking is available at the Expo Center. More than 90 exhibitors will be sampling, selling and promoting products there. Many companies participating have carved out a niche by producing products that are difficult to replicate or find in a gluten-free form, such as the soft pretzels made by Tonya's Gluten-Free Kitchen and The Greater Knead bagels. Local restaurants at the event include Harvest Seasonal Grill & Wine Bar, The Melting Pot, Wildflour Cafe and True Food Kitchen, and there'll be baked goods from The Happy Mixer and others. Attendees over 21 can also try beverages from Aurochs Brewing Co., Blueprint Brewing Co., Stateside Urbancraft Vodka and Boardroom Spirits. The advocacy organization Beyond Celiac, with headquarters in Ambler, is an expo partner and will be promoting the need for celiac disease testing at their booth. I'll be at the Beyond Celiac booth for most of the event (and will also be a part of the VIP meet-and-greet, which starts at 8:45 a.m.), so be sure to say hello. The event is social-media friendly; follow the expo on Twitter (@PhillyGFExpo), Facebook (/PhillyGlutenFreeExpo) and Instagram (@PhillyGlutenFreeExpo) and share your favorite photos and products from the event. The event organizers are giving my blog readers a chance to win two pairs of general-admission tickets to the expo (one pair per winner). To enter, follow the instructions in the Rafflecopter box below. Entries are being accepted through 11:59 p.m. Eastern on Sunday, May 6. The winners will need to respond to a notification email within 24 hours of the end of the giveaway. Good luck! Really want to attend. I'm 3 years diagnosed and still learning! I would like to see vegetarian, gluten free, low carb, low sodium, frozen entrees featured. A girl can dream . Road trip! My kiddo would be ecstatic! We have one in our area in September but this one seems so much larger.